Last weekend found me back at Hughes Water Gardens. The only other time I’ve been there was in March, when it was still too cold for things to be in full swing. What a difference a couple of months make! 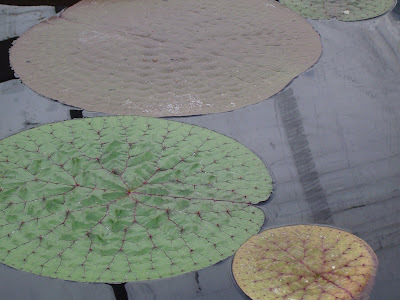 During my first visit I completely missed the tropical water lily greenhouse. Maybe it wasn’t open to the public or I was just too blinded by the timber bamboo to see any further. 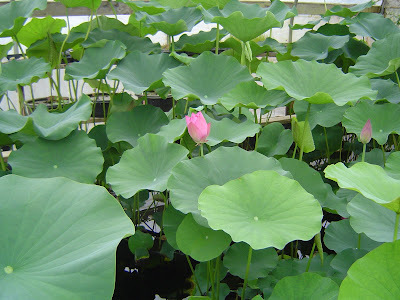 These beauties have me wishing our future (stock tank) pond is going to be much larger than we’ve planned for. Well…we haven’t bought it yet, maybe there is still time to supersize it? Of course a good nursery visit means more than just looking, I’ve got to do my part to support our local businesses! My purchases, clockwise starting with the tall one: a hardy water Canna, Thalia dealbata; a Colocasia esculenta ‘Illustris;’ and the most perfect little Agave ‘Cornelius’ you could ever imagine. Towards the entrance they had much larger containers of the water Canna, this is a rare situation where I was actually happier getting a smaller (cheaper) one, the sculptural quality of the leaves was less evident in the bigger plants. 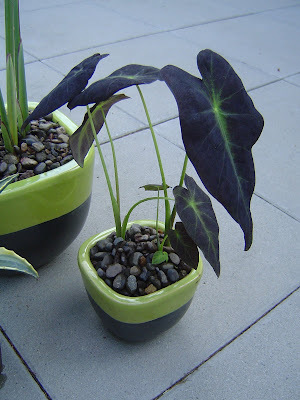 The Colocasia esculenta ‘Illustris’ was a must-have; the color combination was perfect for a little pot I had to put it in. And really I had no intention of leaving Hughes Water Gardens with an agave, I should only be purchasing water lovers right? But just look at the perfection! How can an agave lover pass that up? Well obviously she can’t so she put back an adorable, chunky little papyrus. I’ve already got a papyrus for this season, why do I need another, right? But then who said anything about need? My co-conspirator in plant shopping, Megan, better embraced the spirit and bought one. Go Megan! Plant shopping with friends is certainly a danger. The answer to "do I need this?" is always "Yes!". However, few humans could have resisted your beautiful selections. What a sweet little Agave. I want one. Grace - Megan mentioned wanting Horsetail rush and I wanted to go back to Hughes to see it in its "up and running" state so we ventured down. That lady knows her stuff! It was a fun trip. Mr Hughes is a very entertaining man! And yes I do believe he mentioned being Irish. I went to a lecture he gave at the Yard Garden and Patio show here in Portland. The topic was not nearly as interesting as he was! I highly recommend any opportunity to hear him speak and see his slide show on the garden and his pond. 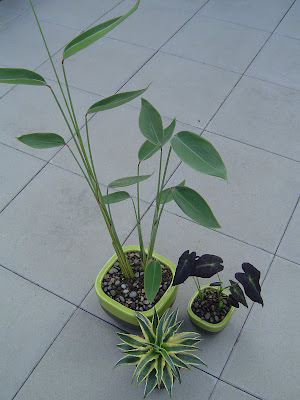 I was very excited about the Colocasia and pot combo...so simple but so fun! Red Studio - do you speak from experience? I think any shopping with friends is dangerous, they are so encouraging! I was trying to be good, 3 plants is reasonable right? And yes you do need one of those agave....definitely! How cool that you guys went plant hunting together. 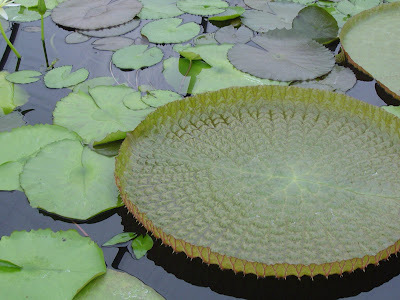 I can see that being both very fun and very $-consuming, since you seem to desire a lot of the same plants and might tend to egg each other on. 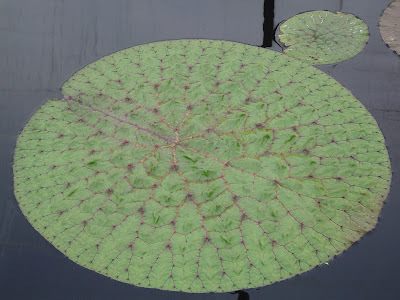 Good call on the colocasia, that pot is perfect. Although I don't exactly understand the whole agave-in-zone-8 thing, that one is a cutie. PS Oh lordy, what is that dessert-plate-looking thing in the 6th photo down? I think you need however big a stock tank to fit that one in. Supersize! Supersize! Your stuff looks great all potted up. I managed to get everything in pots on sunday, started rearranging, and inexplicably, ended up with more empty pots than I started with. Which of course means more plant shopping. Karen - what's not to understand? You really want to live in Arizona but your husband does not. You "pretend' by surrounding yourself with agaves...you even get to enjoy them in the winter because you have to bring some of them in the house! 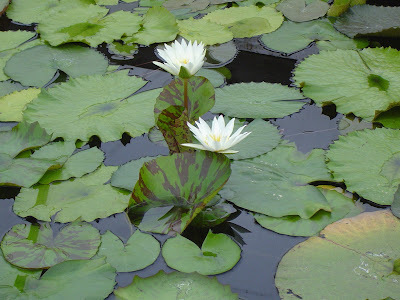 Aren't those lily pads just too cool! Meagn - Thanks! Empty pots!? How'd ya manage that? I went to Garden Fever on Sunday because I realized I needed a pot for the agave! 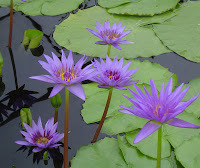 Yummy water lilies! 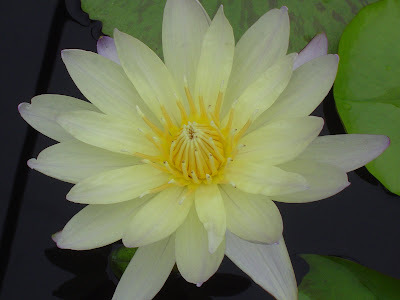 I did a little shopping at a water garden nursery yesterday too and picked up a lovely new water lily for the stock-tank pond I haven't even finished yet. How optimistic is that? It's living in a Tub Trug right now until I finish its new home. 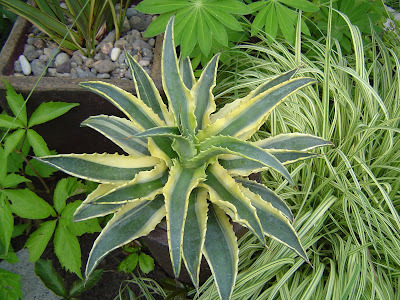 What lovely photos and a cute agave-what type is it-I certainly want one, too!